My name is Jennifer and I have recently inherited a collection of antique dolls. I need some info on several of them. 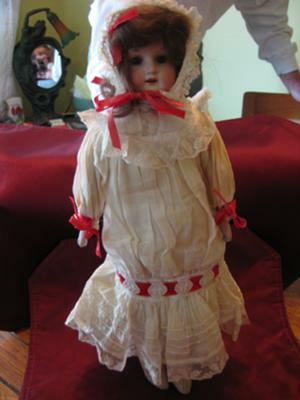 The one that peek's my curiosity the most is a Armand Marseille doll that is marked, A.M, Armand Marseille 8/0 DFP. she is 15 inches tall has sleepy eyes and teeth, what looks like real hair, bisque little hands, leather stuffed body. She is dressed in what I'm sure are original clothes. long white dress, w/ bloomers under, and knit stockings over legs and feet, all trimmed w/lace and red ribbon, and bonnet to match. If you decide to sell any of your dolls, please contact me at jorge_aldea@yahoo.com. Thank You.